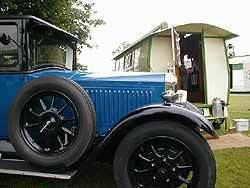 1940s mystery one-berth caravan - can you identify it? 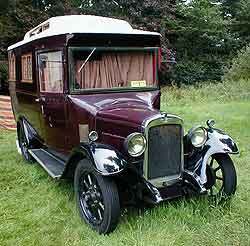 Mystery 1930s/1940s caravan needs identifying! Vintage tea plate issued by Freemans Caravans in 19?? Many classic car owners are travelling further and further afield to motor shows that span two full days, and as such are faced with the problem of accommodation. 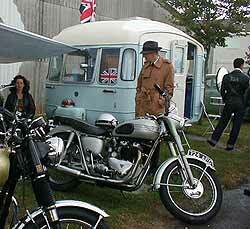 With many such shows being held in large rambling fields, there is often the opportunity to camp over on site. While many of us balk at spending time paddling around in a flooded tent (myself included, I must be going soft), finding slumber in a caravan may be the solution. And not just any battered old 1980s Avondale or Elddis, but a properly maintained historic caravan, of which there are a variety to choose from for all tastes and budgets. Finding a matching caravan for more recent classic cars isn't too much of a problem, although the patience required in hunting down a viable classic caravan increases in line with the greater age of the model you are seeking. Period caravans from the 1970s are still to be found in regular use with regular caravanners, and a look through caravan magazines and free ads papers can sometimes turn up a candidate or two. Anything from the 1950s or earlier, and you'd probably be better restricting your research to free-ads papers and more specialist publications, ie in old car or caravan club magazines. Joining a club dedicated to historic caravans would be a very wise step to take, not only to find out when older models are hitting the market, but invariably you will gain access to a wealth of specialised knowledge on the subject, including vans from the 1920s, 1930s and 1940s and later. 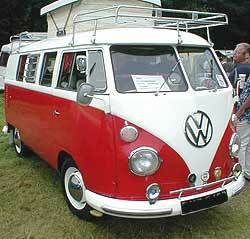 Caravans can vary wildly in terms of size and internal layout, despite on the face of it all looking very similar. 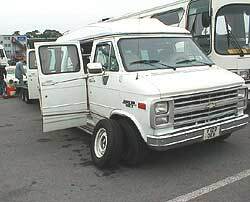 Examples of higher quality 'vans say from the 1960s, survive better than more basic models, often having been bought by wealthier (usually older) owners who look after their investment better, and often hang on to them for a long time. Classic caravans from Safari and Carlight are two examples of the better-built 'vans available during the 1960s, many of which have survived well to this day, and feature (for then) quite advanced features such as underfloor heating and double glazing, both of which were luxurious features back when The Beatles still wore suits, and cut their hair. Much of your decision-making will revolve around the available towcar, and it could be that your faithful old Hillman or Standard simply won't have the ooomph to drag a 22ft long Willerby much beyond the end of your driveway. 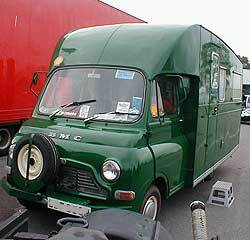 If you do have a smaller car, fear not, because there are caravans designed specifically for smaller towcars. 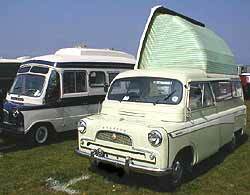 A few years back, when an A40 Farina was my regular steed, I acquired a small folding fibreglass caravan made by a long-since-defunct company called Portafold. Portafolds were made over a number of years, the earlier ones featuring a tubular chassis with neat little fins on the top of the roof, and later ones having a more conventional chassis with less wacky styling, all of which ran on 10" Mini rims. This 12' long creation was very light to tow (I actually only ever towed it behind my 10hp Ford truck), and being low could easily be seen over when towing. The handbook claimed accommodation for five, but I think only sardines could have taken to the sleeping arrangment suggested for this number of bodies, two being a lot more comfortable. Also, despite claims in the literature, it was a bit of a fiddle to put up single-handedly. If you possess a classic car of more muscular disposition, say a nice P5 Rover or Humber Super Snipe, both with lusty 6 cylinder engines, the options are much broader. Most vintage and historic caravans that are still in good order are now in the hands of enthusiasts, hence my suggestion that joining a period caravan / camping club would be a good idea. Here you will find all manner of heftily-built caravans, earlier vintage examples featuring lantern roofs, sunken baths (I kid you not! 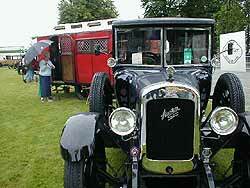 ), gas lights, leaded windows, and many more traditional features. Despite their increased weight over more modern 'vans, the old caravan will easily embarass its modern brother in the quality of the fit and fittings - no MDF and crass chipboard in these oldies, just proper wooden framing, which if maintained and stored properly should last indefinitely. Internal layouts vary considerably, some two berths have a rear kitchen and a single seating area which can be turned over into a sleeping area quite simply, whereas four or five berth designs usually have seating areas at both ends of the caravan, both of which can be turned into double beds, and sometimes an extra bunk bed if needed up top. When checking over a prospective purchase, it is wise to bear some things in mind. Many historic caravans are well into their 40s at least now, and some of that time inevitably will have been spent exposed to the elements, whether the pouring rain so often a feature of Britain, or baking sun in the Outback of Australia. 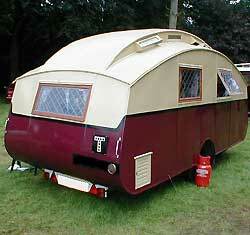 Damp is the big killer of older caravans in the UK. My parents once owned a Coachman 500 (ok not a classic), built in 1989 and maintained very well. Appearances would suggest that it was in perfect condition, and only a slight hint of discolouration beneath a window (assumed to be condensation) raised any eyebrows. On being taken to a caravan repair shop, the horrifying truth became apparent. The entire front end wood (soft wood remember, no oak nowadays) was dripping wet rotten, and had to be replaced at considerable expense. So, older caravans are made of proper wood usually, but given their age this condition could equally be found beneath the skin of an classic example by now. There are tools to detect dampness inside a caravan, and it is highly recommended that any prospective purchase be checked over by a trained caravan boffin to make sure that all that glitters is indeed gold. Be sure to check on the weight of the caravan you've seen for sale - recommendations for what the maximum weight of caravan that can be safely towed behind a car vary, but the rule of thumb is do not exceed 75% of the weight of the towcar. Many moons ago I helped a friend tow a Lotus Excel on a hefty four-wheeled trailer, using his Lada Riva 1500 as towcar. The combined weight of trailer and Lotus was significantly more than the humble Lada wheezing along in front, and any speed over 37mph produced a scary weaving effect as the tail began to wag the dog. That overnight run from deepest South Wales all the way upto Sheffield is permanently engrained in my memory! 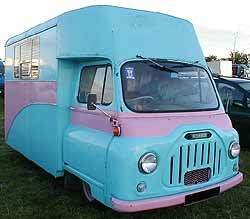 But back to caravans. Exterior damage should be fairly easy to spot, but don't forget the chassis down below. Manys the old caravan that has spent considerable time sat on grassy sites or parking areas, and if the grass has been allowed to grow up around the van's undersides, it will have harboured damp against the steel chassis which can lead to predictable results. Also check the tyres thoroughly. They may have only been used a handful of times in the last decade, but a vintage caravan that's been left sitting on its tyres for a considerable period of time, could have tyres exhibiting significant cracking of the sidewalls, rendering them dangerous to use, despite the treads probably having plenty of life left in them. While on the subject of tyres, check that there is a spare wheel available with the caravan - old caravans may use a wheel with an unusual stud pattern or offset, and finding a replacement could be a real headache if it is missing. The ancient art of greasing, so long the bugbear of motorists in years gone by, applies equally to contemporary caravans, and it's wise to check that greasing, overhaul of brakes and other maintenance has been performed on the caravan and its chassis. While you're checking the 'van over, have a look at all gas and water connections, as leaks of either could lead to unwelcome events! Check that all windows and doors seal properly, and that there is no evidence of dampness, especially if there is a separate bathroom fitted. Also ensure that any rooflights open and close correctly - a loose-fitting window could easily fly off when the caravan is being towed, with inevitable results. Towing a caravan, whether a classic or modern, is an acquired skill all of its own, and if you've not tried it, best bet is to try and persuade someone you know who is a caravanner to take you (in your car with the van) to a quiet area, possibly an industrial estate or empty car park, where you can practice the subtle art of reversing, and negotiating tight corners without destroying the side of your caravan. 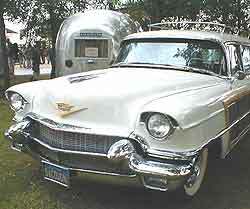 The behaviour of the caravan can be influenced by a number of things. Weight distribution in the caravan is critical. Try to concentrate the weightier items either on, or just ahead of, its axle line. Pile all your family's holiday belongings in the front of the van, and the rear of the towcar will sink accordingly, raising the front of the car and making the steering overlight, and susceptible to crosswinds etc. Similarly, pile all the weight behind the caravan's axle line, and the front of the van will aim for the clouds, lifting up the back end of the car on the tow hitch and once again promote instability and in this case, reducing the rear end grip of the towcar. To check that you are loading your caravan correctly, it is worth seeking advice from knowledgeable owners of similar caravans as to what the ideal noseweight (ie weight at the hitch) of the particular van should be. Stabiliser brackets can be bought to make the ensemble more balanced on a journey, and different types of spring assister can be fitted to the rear of the towcar should it be sagging too much even with a well loaded caravan. If the thought of towing 18ft of vintage living accomodation behind you is just too grim to contemplate, the other option (apart from a local B&B) for staying over at a car show could be by running a classic motorhome. In fact chances are you could display the very motorhome that you are living in. There are quite a few examples of period motor caravan to choose from, some of the most popular being from the 1950s and 1960s, such as examples based on the Bedford CA / HA / CF, Ford Thames 400E, Leyland Sherpa, Ford Transit (Mk1 onwards), and of course the venerable VW Camper, right from the earliest splittie (split window 6v examples) through to the less cutesy bay window campers of the 1970s, all of which make for an eyecatching period camping option. 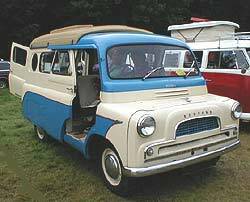 Many such motorhomes were based on popular chassis such as those listed, with some conversions being offered by the vehicle manufacturer, but many, such as the Martin Walter examples on Ford chassis, being produced by an outside company. 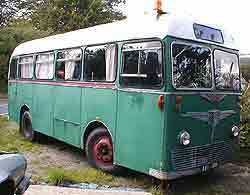 There are still some examples around of much earlier coachbuilt motorhomes, going right back to vintage days, some of which were built on contemporary commercial vehicle chassis, whilst other smaller examples could be found built on converted saloon running gear, although some of these backyard attempts were less than successful or pleasing to the eye! 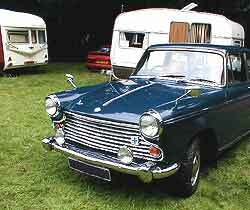 Interest in period caravanning in general has never been greater, and many owners of classic cars and finding that the ideal companion for a historic motor car is a matching caravan hitched up to the back of it. A '60s coach converted into living accom.